Let’s look at Kaiser Leadership Solutions as an example. They have an instrument called the Integrated Personality Summary (IPS). HR personnel and business coaches need to understand a person’s strengths and weaknesses. Hogan’s Personality Assessment is a common personality assessment that would typically take 3 to 5 hours to study the results to be able to give meaningful feedback to someone. The IPS summarizes the assessment data for the HR person or the business coach. The goal was for potential clients to understand the value of this instrument and to purchase it. It’s difficult to communicate the benefits of a product in just simple descriptive text. They wanted a way to connect with the customer base in a way that would help them easily see the benefits of this instrument to their business. 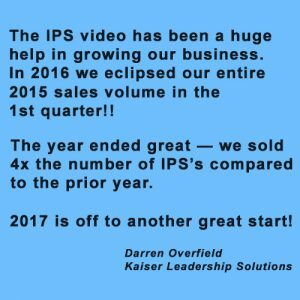 The first step was to meet with Darren Overfield of Kaiser Leadership Solutions to figure out the core benefits of the IPS. We selected a couple of clients who were willing to be interviewed about their experience using the IPS. Finally, we scheduled everyone’s interviews on the same day. It’s easy to talk about something that you know. That’s why our videos don’t seem scripted. The interviewee simply talks to me (I’m sitting to the side of the camera) and answers my questions. We take all of the interview footage and edit together the most powerful video possible. We add some cool graphics to it, mix in some complimentary music, and upload the final video for our clients to use. Please contact us if you are ready to talk about your product video. We promise that it will be the best marketing investment that you make! Please give us a call at (336) 403-9273 to speak with a Charlotte Video Production company, or fill out our contact form. We look forward to helping your organization use video to achieve your goals.